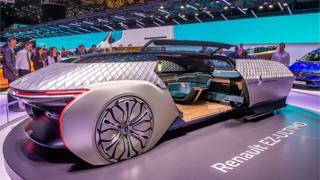 Most carmakers are investing heavily in everyday electric and autonomous vehicles, but Renault thought it would be good to see what a self-driving limousine might look like. The French manufacturer thinks there will be a market from luxury hotels or airports to offer a five-star ferrying service. The EZ Ultimo is, though, still on the drawing board. David Brown Automotive may not be a household name, but its classic cars have a big following. 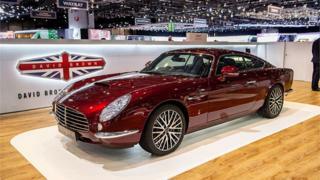 This retro-styled Speedback GT was actually launched two years ago. But no two of the handcrafted cars are the same and this one comes with various tweaks and more power. They're not cheap, though, with the prices ranging from £500,000 to £750,000. Hispano Suiza is an historic car company based in Barcelona and the new owners are trying to rejuvenate the brand. 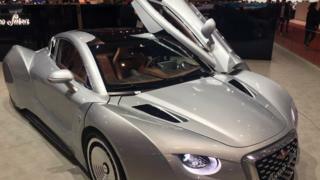 This £1m-plus two-seater electric supercar, named the Carmen, is aimed at what the industry calls the hyperlux consumer - people who want hypercar performance with the sort of luxury found in a Roll-Royce. In an era of driverless tech and ride hailing, carmakers are looking at how people will travel in the future. 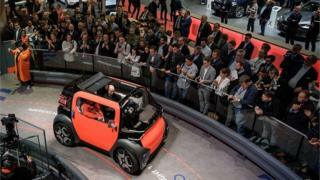 Citroen's AMI-One, with a top speed of 28mph, could be driven without a licence in some countries. Citroen sees it as a car to be shared, not owned. And it can be operated by smartphone. But it's still in the concept stage. This year's Geneva Motor Show is all about electric cars, but Bugatti proved that the good old internal combustion engine is still a winner. 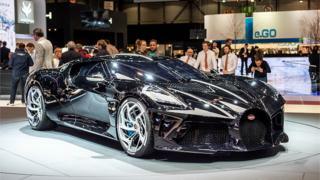 It's one-off La Voiture Noire has sold for a reported £9.5m before tax, a record for a new car. Made to celebrate Bugatti's 110th anniversary, it does about 260mph - and has six exhausts so you can hear it coming. 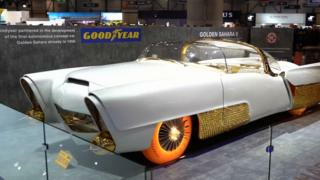 When the Golden Sahara II landed in the 1950s it was hailed as a car for the jet age. It had a central lever for acceleration, braking and steering and new-generation tech. The flashing fluorescent wheels were an experiment by Goodyear for night-time driving. Costing $75,000 to build - a small fortune in today's money - it was left in a garage for decades. Klairmont Kollections has restored it to its former glory. There was a big turnout of products from Aston Martin. 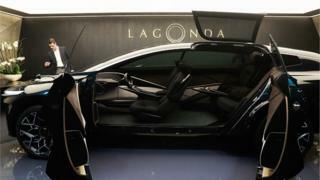 But one head-turner was its unveiling of the first Lagonda car that will be produced under its revival of the historic brand, the All-Terrain. The electric car will rival Rolls-Royce's Cullinan and Bentley's Bentayga, but boss Andy Palmer believes his car will appeal more to tech millionaires. Dune buggies were all the rage in the 1960s and 1970s. Well, they were if you were part of the California surf culture. Volkswagen thinks there could be a new market for the high-suspension vehicle, and has brought this all-electric ID Buggy concept to Geneva (where they do actually have beaches on the lake). 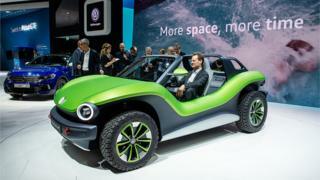 The Buggy will be all about "fun", says VW. 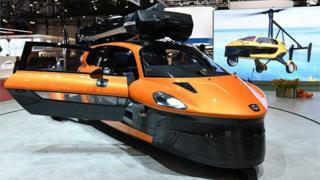 Dutch company Pal-V insists it is still on track to put the world's first flying car into production. The company brought its Liberty Pioneer Edition to Geneva, of which about 90 will be made initially. It has a dual cockpit and electronic flight instrument panel. Compared with some of the exotica at Geneva, the $600,000 price seems like a snip.